"All over the arctic, animals wait longer and longer for signs that the ice is returning." The success of March of the Penguins made it natural that the other end of the globe might be the focus of a similar documentary, and the this picture fills that niche nicely, right down to the style of narration and photography that tells a story of survival under bitter conditions. At the same time, there is no sign of the photographers, which makes us feel exceptionally close to the creatures that are the focus. At the center of the tale are two youngsters of the arctic: Nanu the polar bear cub, and Seela the walrus pup. They must learn from their respective mothers the arts of survival under the harsh conditions of the arctic, and how to use the thick ice for survival, and for the polar bear, also to use it for hunting. But as the winters get shorter and shorter, the ice eventually is present for so short a time that starvation and death are inevitable unless they can find a way to adapt to their suddenly changing conditions. The two stories intersect as the the herds of walruses and several polar bears make their way to an island of rock in the arctic, which presents its own challenges to both of these species and others. The film does a bit of anthropomorphizing of the creatures, though often the camera captures such vivid personality moments that it seems wholly appropriate. Particularly moving is the struggle of Nanu's brother to survive during a harsh winter storm, and the mourning of the mother as she waits vigil over his dead body. Equally moving is the moment when Nanu is reluctantly driven away by her mother, unable to find any food for them. The community spirit of the walruses, including the self-sacrifice of one of the cows in order to rescue Seela, is certainly unexpected and gives one the sense of a moral imperative amongst them. The photography is frequently amazing. The most spectacular are the underwater sequences that follow the walruses as they swim gracefully beneath the ice, and the diving of the thick-billed murres. Toward the end, as Nanu bears her own cubs in a den of snow, the crew somehow managed to get footage of the newborn cubs with their mother, deep in the den. Even though there isn't nearly as clear a narrative thread as in March of the Penguins, the viewing is nevertheless compelling as we wait to see what crises will befall the creatures that we get to know. While the main feature is fairly restrained in its treatment of global warming, simply presenting the facts without laboring the point of its causes and future progress, that's not the case with the end title tag; it's full of children preaching about saving energy, in the vain hope that global warming isn't already well past the tipping point. 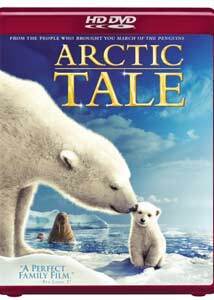 But it's difficult to watch Arctic Tale and conclude anything other than that there may well be no future at all for this biome, even if all greenhouse gas emissions were completely stopped today. Image Transfer Review: As was the case with March of the Penguins, expectations have to be kept a bit lower here because of the extraordinarily difficult filming conditions. In particular, one doesn't want to get all that close to a starving polar bear when one is weak, juicy and tasty, so the bear footage tends to be quite grainy due to the distances involved. The walrus footage is much cleaner. However, the HD rendition makes the grain look natural and not sparkly, so it's entirely satisfying. The palette is obviously muted, but there's plenty of diffentiation in the various tones of white. Textures are excellent, particularly the sheen on the walrus' skins. Water is well rendered as well. Given the situation, this looks quite nice, and comparing it to the standard definition footage in the extras the HD version is well worth the upgrade. Audio Transfer Review: The audio is nice and clear, with Queen Latifah's narration coming across with good presence, though it's definitely center-anchored. The score by Joby Talbot has a pleasant but slightly off-kilter feeling that makes the visuals feel both familiar and strange. The music has excellent range, although I could have done without the several lame folk-pop songs that are heard periodically through the picture. Extras Review: The principal extra is a Making of documentary (24m:05s), which covers the fifteen years devoted to filming, including the tedious months of waiting for a bear to attack the walruses. It's interesting and underlines the patience that is the essence of documentary filmmaking. There are some amusing moments too, such as when photographer/director Adam Ravetch nervously acknowledges to the camera that being alone with the male polar bear while his companion goes for supplies was probably not the best of ideas. An episode of Are We There Yet: World Adventure (6m:58s) is devoted to polar bear spotting in a giant Tundra Buggy, but it's too focused on the children who are going on the ride to be very substantial, especially since they quickly get bored with the proceedings themselves. Unadvertised on the case is the inclusion of the theatrical trailer, which is the only extra presented in HD. Beautiful documentary footage with a sobering message. The transfer is excellent, considering the filming conditions.